I’m pretty well known for not agreeing with SIBA, the Society of Independent Brewers. There are a lot of things they push for that I don’t believe are right for smaller breweries. However, at times it makes sense for us all to work together for the greater good, and they have access to data that I don’t, and they are willing to share it with me. This weekend one of the things I was given was their collected data on production costs from some of their members who were willing to share this information. And it’s very interesting reading, especially in light of the report that the Small Brewers Duty Reform Coalition (SBDRC) have presented to the government as part of their case for a reform of the Progressing Beer Duty (PDR) and Small Brewers Relief (SBR). I went through these figures earlier, and the initial thing that stands out is the startling difference between the two sets of data. And a little bit more looking shines light on different aspects of our industry, including some major differences in how small to medium, and medium to large breweries make their beer, it seems that the medium to larger breweries are tight on their “finest” ingredients. The figures presented here are from the original Europe Economics report, commissioned by the SBDRC and paid for by the British Beer and Pub Association, and from SIBA’s own membership survey. The costs are based per hectolitre of production, and broken down into different areas. 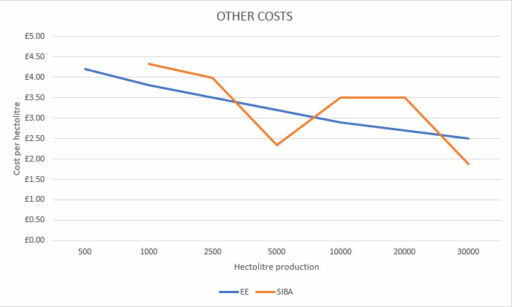 You can see from the SIBA data (orange) that the cost of malt doesn’t suddenly get cheaper as a brewery grows, but rather after a short rise starts and continues a steady decline. Yet the Europe Economics report seems to think that it gets massively cheaper, dropping from £9.50 per hectolitre at 5khl, to £5.20 at 10khl. The initial thought from this is that the SBDRC seem to agree with the report data. That at 10,000 hectolitres, you suddenly pay less than half for your malt. Which means that members pay those rates. 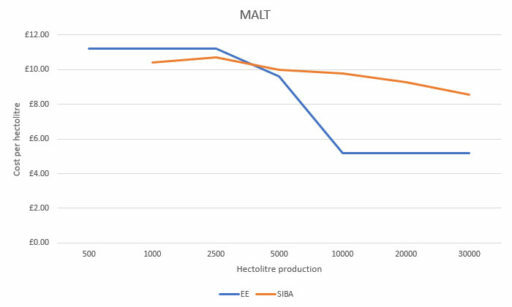 The SIBA collected data shows that at 10khl bulk purchase advantages don’t give that much of a benefit, so the only other explanation is that the members of SBDRC are using cheaper, inferior grains. Again, there’s a huge difference between what the bigger breweries think the smaller breweries pay, and what they actually do. 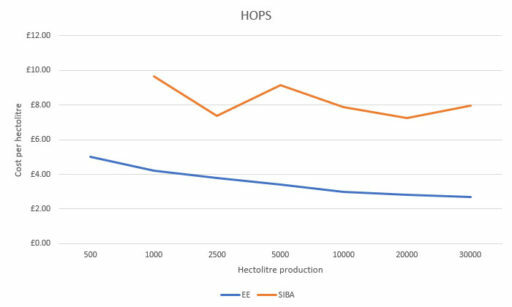 The EE report stated that breweries around the 2.5khl mark were paying £3.80 p/hl for hops, yet actual data from SIBA members shows that they’re paying £7.38 p/hl, and that at 10khl breweries were paying £3.00 p/hl when in fact it’s £7.89 p/hl. There’s an interesting spike in the actual costs around the 5,000hl mark, which I’m wondering is because breweries at that size are producing hoppier (possibly stronger) beers, so that they can maintain production volumes, but produce higher margin beers, as below 5khl is the production volume where the current full 50% SBR comes in. The reason for the disparate figures? Again, likely because members of SBDRC are either using a lot less hops or are using much cheaper ones than the smaller breweries. Target is currently £7/kg on the spot market at the moment whereas Amarillo is £27.22. Although it’s also worth bearing in mind that medium to large breweries won’t be using the spot market much, but rather buying their hops on contract up to three or four years in advance, guaranteeing them even lower prices, further distorting their view of what the smaller breweries are actually paying. This is possibly the closest the data produced by SBDRC gets to reality, at least at first glance. Other costs are things like brewing adjuncts, fruits, spices, sugars, essences and flavourings, these sorts of ingredients. It’s hard to compare prices per hectolitre for these, without knowing exactly what people are using. However, it is known that while a smaller brewery with use raw ingredients, larger breweries will use flavourings for convenience and consistency. An example of the cost difference here would be for a peach beer; peach essence works out at £0.05 per litre, whereas using fresh peaches works out at £0.16 per litre. Not taking into account the staff time to process them. Now for an incredibly telling graph: labour. This is the staff wages that people in the medium to big breweries, the ones that are wanting a tax cut, pay their staff. Compared to what the smaller breweries actually pay their staff. The figures aren’t an hourly rate but staff costs per hectolitre produced. Bigger breweries think that it costs £9 p/hl for a 5khl brewery’s staff. When in actual fact it’s £18.64. More than double. There are two things that count for this difference. Production efficiency and staff wages. The production efficiency is how many staff are needed to make the beer, and the wages is how much they pay them. Smaller breweries take more staff hours to produce the equivalent amount of beer as larger breweries. Whether you’re brewing on a 5bbl, a 10bbl, or a 25bbl kit, the process is generally the same. Where the differences come in are time taken to move the liquid from one vessel to another, more liquid takes longer, and that means staff hours. And more malt means it takes longer to both put it in, and dig it out afterwards, until you get to the size of kit where it’s all automated. Larger breweries mash in by setting dials on their hop silos, and pressing a button, they dig out their mash tuns by moving a skip underneath, and pressing a button. On a smaller scale, you get the shovel and get hands-on. 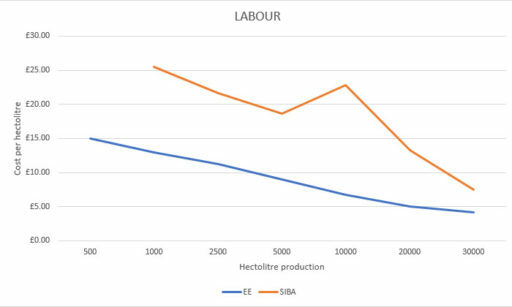 Smaller scale brewing is much more labour intensive than lager scale, needing more staff and therefore more wages, far more than the SBDRC seem to think. Rent paid by breweries at the smaller end of the scale is almost three times more than the SBDRC state. 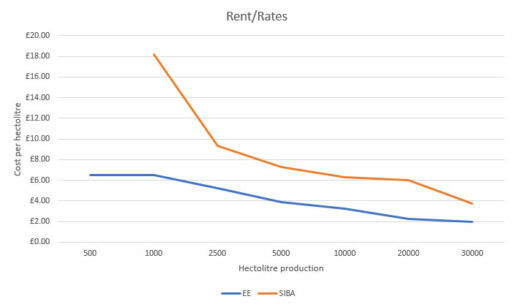 Their report claims that rent and rates for a 1khl brewery works out to £6.50 per/hl, whereas the latest SIBA data shows that it’s actually £18.18 per/hl, a huge difference. The figures then settle down to £3.90 per/hl at 5khl, compared to the SBDRC claim of £7.31, only almost double. There’s more to these figures though, brewery premises tend to get absolutely crammed with equipment, you fit as much in as you can. But there’s only so many premises out there, and they are all roughly the same sizes. So the cost of rent for premises with a kit capable of 5khl or for one hosting a 10khl kit should be about the same, which means that the cost per hectolitre of 10khl production should be about half that of 5khl production. But unfortunately, that’s not the case. Because the physical size difference between brewing equipment of that scale is quite vast. A brewery capable of 5khl could double its production by doubling its number of fermentation vessels, as well as conditioning tanks. Which take up extra space. And then there’s additional things like bottling, canning, kegging or even casking lines to package and shift that extra production. This chart however makes it look like the 5khl brewery is paying roughly the same price per hectolitre production as the 10khl brewery (£3.90 to £3.25), but what comes into play a lot is location. A 5khl brewery can operate out of somewhere near a city centre, but a 10khl would struggle to find suitable premises, and therefore has to locate themselves on larger industrial parks on less prime real estate. Currently in Manchester city centre there is space suitable for a small brewery costing £26.25/sq. ft. pa., whereas in an industrial estate in one of the suburbs there is a unit suitable for a larger brewery costing just £1/sq. ft. pa. That cost difference is quite substantial, and whilst you could set up a smaller brewery in there, you lose the ease of access, transport links and passing trade for a brewery tap amongst other things. However, the figures that small to medium breweries are actually paying for their rent and rates is still a lot more than the SBDRC commissioned report states. These are just a few of the things covered by SIBAs newly collected data, which give quite a different view on things to the BBPA paid for report. We can see from this chart the overall difference in production costs in the report, and from currently operating small brewers. At the lower end of the scale here, the differences are around the 45% mark. It costs a 1khl brewery 45.5% more to produce beer than the medium to big breweries claim (£91.32 compared to £62.78), at 10khl it costs 105.5% more than they claim (£65.57 to £31.90) and at 30khl it costs 75.4% more than they claim (£44.13 to £25.16). Now, why are these figures important? Surely it doesn’t matter much that they got them a little wrong? Here’s why… These are the alternative facts that SBDRC presented to the government as their case why smaller brewers should pay more Duty, so that they could pay less. The data used in the EE report comes from two sources. The first being a 2006 survey conducted by BBPA and SIBA or 27 breweries. The data in that survey is 13 years old. The second source is from a specially written questionnaire covering 105 breweries, to understand the “views on the purpose, impacts and unintended consequences of the SBR as currently structured, and preferences on possible options for reform.” The report itself doesn’t include a copy of the survey so it’s not possibly to know for sure how biased it may have been, but that wording along gives us clues. 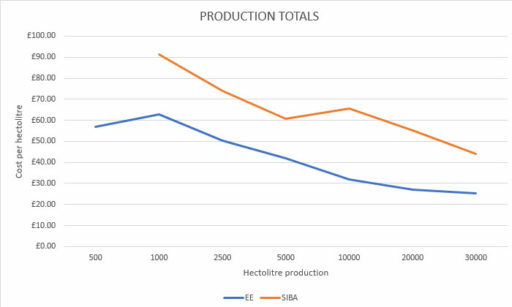 It may well be that the differences in the cost of production between the EE report and SIBA’s current data is down to those 13 years, and the increase in the costs of ingredients, staffing and other overheads, and that no modern data was used. And that the questionnaire of the 105 breweries was used purely to decide how they would like to change the market. But who were those 105 breweries? We don’t know as the report doesn’t say. We don’t even know who the members of the Small Brewers Duty Reform Coalition are, who commissioned the report from Europe Economics, but we can see who the members of BBPA are who paid for it. The BBPA “members account for some 90% of the beer brewed in Britain today” according to their website (https://beerandpub.com/bbpa-members/) and that’s not a surprising statistic when you see that they have ABInBev (Budweiser, Corona, Stella Artois, Leffe, Hoegaarden, Bass, Boddingtons), Asahi (who just bought Fullers), C&C Group (Bulmers, Tennants, Magners, Drygate, Orchard Pig, Pabst (who in turn own part of BrewDog), Carlsberg (Carlsberg, Tuborg, Kronenbourg, Holsten, Baltika, Mythos) , Diageo (Guinness), Heineken (Heineken, Strongbow, Fosters, Maltsmiths, Deuchars, Murphy’s Newcastle Brown), Kingfisher (Kingfisher, Lion), Marston’s (Marston’s, Bank’s, Jennings, Ringwood, Wychwood, Brakspear, Mansfield, Shipyard, Young’s Wainwright, Courage, McEwans) and Molson Coors (Carling, Coors, Cobra, Grolsch, Doom Bar, Blue Moon, Singha) amongst their membership. That’s some big-name beer money behind the SBDRC report. Unfortunately, the SBDRC aren’t as open about their membership as BBPA. When they launched, they stated that they had over 40 breweries as members, and that then grew to over 60. But they’ve never listed them all. Their website (reformsbr.com) doesn’t list them, and repeated emails from some beer bloggers has failed to get a reply from them. But some digging reveals an initial published list (https://cask-marque.co.uk/small-breweries-reform-coalition/) from when they started in 2017, and before they started getting flak from smaller breweries for their proposals. This list of 41 breweries however is a little disingenuous. Charles Wells no longer brew but rather their brands are brewed at Marston’s, a brewery whose name is not on that list. Except it is. Charles Well, Jennings, Ringwood and Wychwood are all owned by Marston’s, a company with a net income of £84.7 million. There are also breweries on there that are no longer independent. Beavertown were listed as members at the start, but quickly pulled out when they found out that SBDRC were looking to remove SBR for the smaller brewers. They’re now also owned by Heineken. And Fuller’s along with Dark Star are now owned by Asahi. What’s then left, is a range of older family brewers. Of those remaining 34 breweries pushing for a change in SBR, out of over 2,000 in the UK, 18 are members of the BBPA who funded the EE report. But when you add back in the weight of other BBPA members (Marston’s, Asahi, Heineken) you can see that it’s not a mere coincidence that BBPA funded the EE report for the SBDRC, there’s a lot of crossover there. Last year I wrote about what the SBDRC wanted (http://beernouveau.co.uk/small-brewers-relief-reform/) and it’s not changed. But there is one more worrying thing that’s coming to light with the connection to BBPA, the pubcos. Admiral Taverns, Brakspear, Charles Wells, Ei Group (formerly Enterprise Inns), G1 Group, Star (part of Heineken), Punch and Trust Inns are all BBPA members, and along with the tied estates of the family brewers, that’s an awful lot of pubs and bars that are happy to be associated with, if not directly pushing for a change in SBR to benefit the much bigger breweries. With less small breweries out there, and there will be less if these changes go ahead, there’ll be less call for the PubCos and tied estates to open up their lines to guest beers. There’ll be less choice for the drinker, both in what to drink, and where to drink, and we run the very real risk of losing part of our country’s heritage, that of good beer, purely because some big international corporations and some large British breweries want more profits for their shareholders.